Each hardcover purchased will arrive autographed by Bill Cummings. This is a Kindle preview—available for $4.99. Purchase paperback and hardcover editions at left. Hardcover books signed by author at no additional cost. Buy direct to maximize the charitable proceeds. Use the dropdown above to select one of these options. * For international orders, please contact Lisa at lvs@cummings.com. To purchase Starting Small, use the dropdown menu above. Bill Cummings never aspired to be a billionaire—and never acknowledged he was one until long after it happened. That’s because it is not money that motivates him, but rather the immense enjoyment he gets from building and growing successful businesses. He thrives at being an opportunist and believes that this often-misunderstood trait is one of the key characteristics of successful entrepreneurs. They see opportunities where others overlook them. And they act swiftly to adopt them before someone else does. Although perhaps not intentionally, Bill’s parents encouraged his entrepreneurial nature by instilling in him the desire to "get ahead" and to become "somebody." His father painted houses, raising a family in a one-bedroom apartment atop a liquor store and a taxi stand on the outskirts of Boston. Bill’s mother was a neighborhood fixture, building friendships as she knocked on doors to collect coins for large charities that once operated that way. 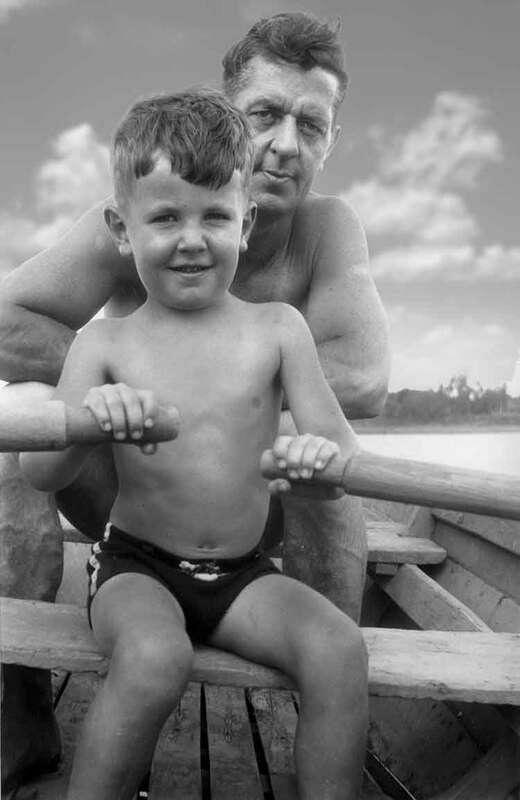 From his parents, Bill learned the value of hard work, kindness, and fiscal responsibility. Year-round he washed windows for his neighborhood’s storekeepers, and for three summers as a young teen he sold ice cream from the back of his bike at a nearby Ford Motors assembly plant. Later he purchased and sold dozens of small boats using Boston Globe classified ads. Eventually, he built a 500-person firm near Boston with a debt-free portfolio of 10 million square feet of commercial real estate. This fascinating self-written autobiography shares not only how he got there, but also his singular dedication to giving back to the communities and institutions so vital to his success. In Massachusetts alone, the cash donations from Cummings entities to local charities already total more than $240 million. Through Bill’s unique voice, readers experience his achievements and adventures—including a stint at Fort Dix with Ralph Nader and, much later, meeting and working regularly with some of the world’s greatest philanthropists—as well as his setbacks and personal tragedies during the seven-decade story. MY DAD, Gus Cummings, was considered too old for military service during World War II. He spent the war years working for Bethlehem Steel Company at Fore River Shipyard in Quincy, Massachusetts, and took great personal pride in his work: painting the interiors of destroyers and light cruisers. By accessing the sample chapters, you acknowledge that the reproduction or transmission, in any form or by any means (electronic, mechanical, photocopying, recording, or otherwise), is prohibited without the prior written permission of the copyright owner. Here is what readers are saying about this engrossing story of how a local youth became an extraordinary success and is now giving back in a major way. Members of the Giving Pledge, established by Warren Buffett and Bill and Melinda Gates, Cummings attributes his and Joyce's extraordinary dedication to giving back to their community—to institutions large and, mostly, small—to what he describes as their "belief in the goodness of all humanity." Doing the right thing, leading by example, and incorporating charitable giving into every aspect of his immensely successful business is how Bill Cummings has honored Jamie and others who have impacted his and Joyce's thinking, some on a grand scale, and many, many others on a small, local level. 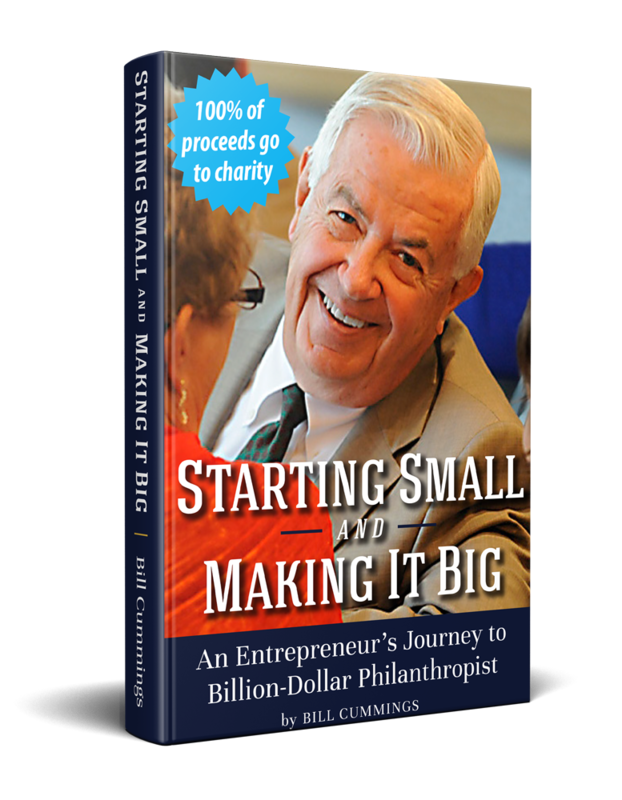 In some ways, "Starting Small" is a textbook on how—and why—to give, as individuals, and, importantly, as an integral part of the corporate culture. Yours is a fascinating account, full of valuable lessons for readers ranging from aspiring entrepreneurs to experienced managers. Yet the book's appeal reaches far beyond the business world. In your reflections about relationships, principles, and the nature of success, you offer wisdom that will benefit people in all walks of life. I certainly recognized many of the names noted in the book and I felt resonance with the struggles and joys of leading an organization in Boston over the past several decades. I have recommended your memoir to our faculty for discussion with our students, particularly our management students. I am sure these conversations will be most engaging. Unlike the other framers of the Constitution, Benjamin Franklin grew up poor, as did steel magnate Andrew Carnegie. Through shrewdness and hard work, both accumulated substantial fortunes. In 1790, Benjamin Franklin left a legacy to the citizens of Boston that Andrew Carnegie matched in 1906, leading to the founding of today's Benjamin Franklin Institute of Technology. Mr. Carnegie accumulated a far greater fortune than he could ever use and sought—albeit unsuccessfully—to give it all away before he died. Bill and Joyce Cummings'personal philosophy about charity is not to "give until it hurts," but to "give until it feels good." They have already given more than $200 million, and don't feel good enough yet. As if Bill Cummings hasn't accomplished enough, he can now add book author to his long list of achievements. 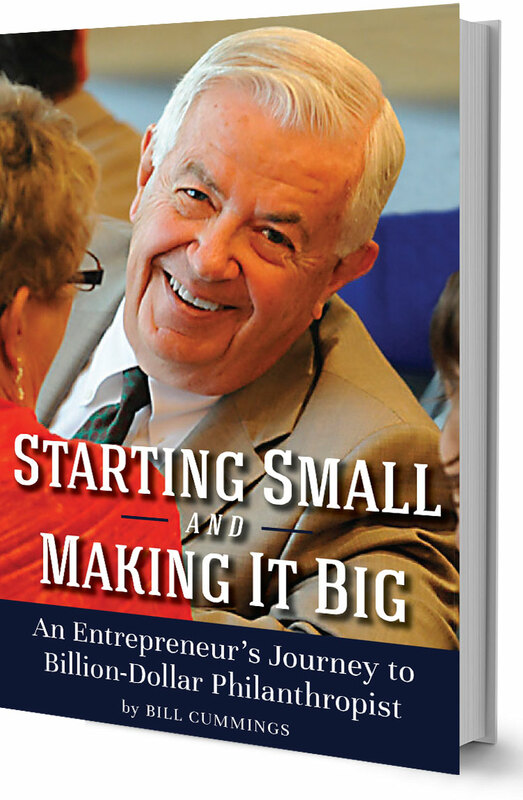 Bill's new book, Starting Small and Making It Big, is a true entrepreneur's blueprint designed by a man who has spent a lifetime spotting opportunity where few can see it. Considering that Bill's venue for his first business venture was a Radio Flyer wagon from which he sold drinks to a thirsty road crew, Bill has a long history of profiting from what can only be described as an incredibly keen business sense. The billion-dollar philanthropist's autobiography proves that even entrepreneurs as successful as Bill must start somewhere. In Bill's case, starting somewhere included renting a vacant lot to sell Christmas trees when he was a student at Tufts, salvaging a boat that had sunk in a hurricane, and sweeping seemingly worthless brass casings off the floor of a rifle range to recycle for profit. The title for Bill's book couldn't be more appropriate seeing that these initial small self-made opportunities were the springboard to starting a real estate firm that has acquired more than 100 buildings. Bill's first major business purchase, Old Medford, is a clear example of Bill's no-nuisance straightforward negotiation style. In the book, he describes how he first approached the seller by saying, "My dad says I should buy your fruit-punch business, but I don't know why I would want to pay anything for a business that had almost no sales and no income." Bill whittled down the $40,000 asking price and over six years expanded the company so successfully that he was able to sell the business that he purchased for $4,000 in 1964 for nearly $1 million in 1970. Resurrecting the old United Shoe Machinery Corporation building (The Shoe), a "monster" of a property located in Beverly, was a project that Bill is especially proud of. Cummings Properties purchased the 1.5 million square feet of "historic concrete memories" and two ponds for $500,000. While there was some expectation that Cummings Properties would demolish what Bill describes as an "enormous decaying relic from America's golden age of manufacturing," that is not Bill's way. "What we do is support the redevelopment and repurposing of older buildings," says Bill. There was also doubt as to whether there would be enough tenants to fill the vast space but Bill once again did what he does best -- taking on projects that many feel are not possible and making them wildly successful. Not only is Cummings Center fully occupied, but the massive restoration project increased local home values and decreased long commutes for many of its tenants. "There were 6,000 people who worked there during World War II and there are probably 6,000 people who work there today. They're all above-average jobs and there are a whole lot of people who don't have to travel down 128 to go to Boston anymore. They work right there and raise their families there and they don't have to go far away to do it," says Bill. Relocating the county seat from Cambridge to TradeCenter 128 in Woburn was a feat that even Bill was a little skeptical of initially. Yet, once he began to envision the new home for the Middlesex County Superior Court, he never looked back. In typical form, Bill used his own in-house design team to customize the six-story floor building to accommodate all the specializations required for a courthouse. Once again, many questioned the wisdom of investing time and money to customize a building for a "temporary" client. A little over a decade later, TradeCenter 128 is still the proud home of the courthouse. Bill's book shows there is more to a successful entrepreneur than just having good business sense. Bill also has good people sense. He considers employee satisfaction vital to any business, which is undoubtedly the key to employee longevity at Cummings Properties. Because Bill places such a high level of confidence in his employees, they cannot help but to shine. And when they do, no one is happier than Bill. As Bill tells the story of how a Medford boy from a blue-collar family became a billionaire, he weaves advice throughout the book that is useful for both new and veteran entrepreneurs alike. It is no secret that Bill considers drive and determination more essential to entrepreneurship than the type of degree you have or the university you attended. Bill does not shy away from hard work nor does he go out of his way to avoid risk. He still gets into the office at 5:30 with his entrepreneurial toolbelt in hand, bringing with him a degree of energy that is both infectious and rejuvenating. Of course, for a man who has traveled the world and gone bungee jumping off the Kawarau Bridge in New Zealand, a day at the office might just seem like downtime. Bill emphasizes throughout the book that his love of business exceeds the financial rewards. Some of his greatest accomplishments are not constructed from concrete and steel but from the joy that Bill and his wife Joyce receive from helping organizations make a meaningful difference. When Bill and Joyce started the Cummings Foundation in 1986, they were already allocating 10 percent of net earnings every year to support various community charities. To hear a philanthropist like Bill say his biggest regret is not giving earlier is quite surprising since Bill and Joyce have clearly already contributed so much to society. While Cummings Properties was establishing its headquarters in Woburn, Bill and Joyce were establishing their own residency in Winchester. The Flats residents love their quiet community where they can walk to the town center and where Bill can ride his bike. They have made quite an impact on the community by supporting many of Winchester's nonprofit organizations. Bill and Joyce were instrumental in finding a permanent home for the Winchester Community Music School, which Bill describes in the book as an "integral part of the town." They sent three of their children to the school and their grandson now attends the new school that Bill and Joyce made possible. In 2011, Bill and Joyce became the first Massachusetts couple to join the Giving Pledge, the philanthropic organization founded by Bill and Melinda Gates and Warren Buffet. The couple, who have clearly dedicated as much time giving away their money as they have spent making it, like to think they are still the same people they have always been. The emphasis and value they place on family and their many longtime friendships far eclipses the value they place on their wealth. This, coupled with their enduring commitment to effect meaningful, positive change both locally and throughout the world, are a testament to Bill and Joyce Cummings. Sign up for updates on Bill Cummings' writing, news stories, and more.